The tree grading and plant counting products provides an assessment of each individual tree in an orchard to help growers manage trees for top production. 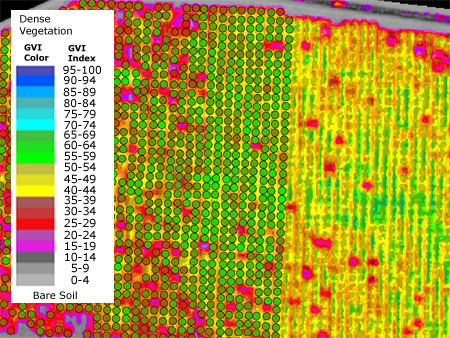 Satellite image data or UAV Imagery can be collected in support of agriculture management developing tree grading maps and plant counting reports to reveal the location and extent of each tree canopy and plants determined by using a proprietary spectral algorithm. The properties of the GVI satellite images within each polygon are extracted to an industry standard Geographic Information Systems (GIS) database. The GIS software is then used to view and analyze the data. A satellite or UAV image and GIS map of missing trees is also created so the manager can plan for replacement. AgroWatch™ is a registered trademark of DigitalGlobe.